← Monday Question- Which Perfume Would You Want To Buy Right Now? Editor’s Note: Due to Tara’s travelling to Vienna this week, we have her traditional Thursday post on a Wednesday. Enjoy! The last two fumie get-togethers organised by the wonderful Pia of Volatile Fiction have been an absolute blast. 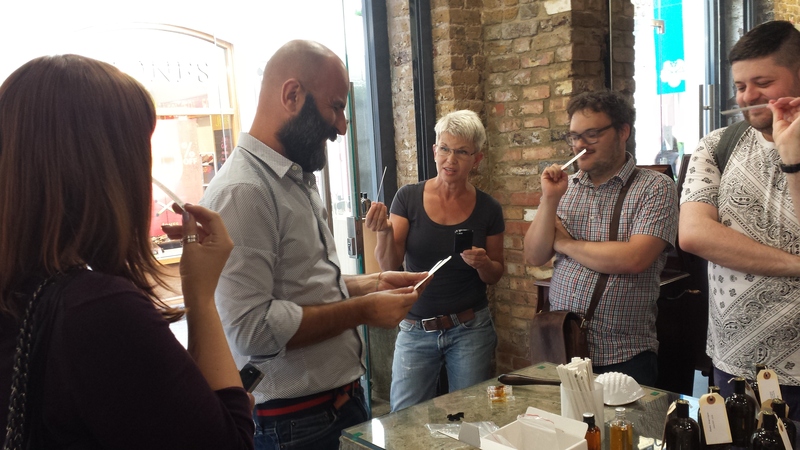 They basically involve a bunch of fragrance fanatics from far and wide being let loose in London for a summer’s day of sniffing, sampling and all-round indulgence. Well, this year’s event was bigger and better than ever despite an all-out strike on London Underground. 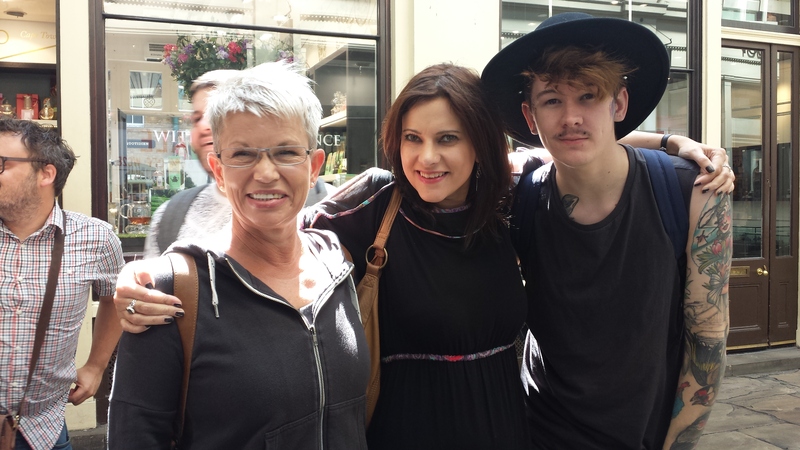 What made it extra special was that we were holding it on a weekday so that OT and Australian Perfume Junkies‘ very own Val the Cookie Queen could join us while she was over from Austria, along with her gorgeous daughter, Hannah. The other revellers were Thomas (The Candy Perfume Boy), Nick (Nick Gilbert Perfume), Suzy (The Perfume Society), Grant (owner of Basenotes), Samantha (I Scent You A Day), Freddie (Smelly Thoughts), Penny (Orchadia), Lisa (Wordbird on Basenotes), Steven from Canada (Odysseusm on Basenotes) and Andrew. 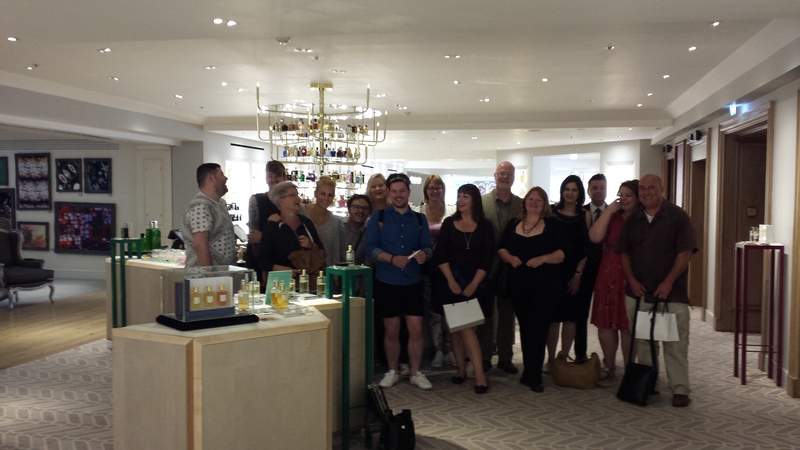 Most of us convened at around 11am at Penhaligon’s in Covent Garden’s Market Buildings, where Nick is the Global Fragrance Ambassador and staff trainer. We were downstairs in the basement where Nick laid out a large array of Penhaligon’s and L’Artisan Parfumeur fragrances for us to try (both are owned by the same company). The light suede base of Iris Prima is a particular favourite of Pia’s, while Hannah was very taken with the fruity pick-me-up of L’Artisan’s Haute Voltige. She clearly takes after her mother because she said it reminded her of Christmas trees and it turns out there is indeed fir balsam in the base. I tried Penhaligon’s Peoneve because I know Thomas is fond of it. It’s very fresh and green and their biggest seller in China according to Nick (and he would know). Val was impressed by L’Artisan’s Traversée du Bosphore and we all sampled Penhaligon’s new Rose Privée which is a very nice rose on a bed of soft hay. Their spring release, Ostara, is an extremely realistic daffodil scent. Before we left, I bought a bottle of Tralala for a couple of friends to split. 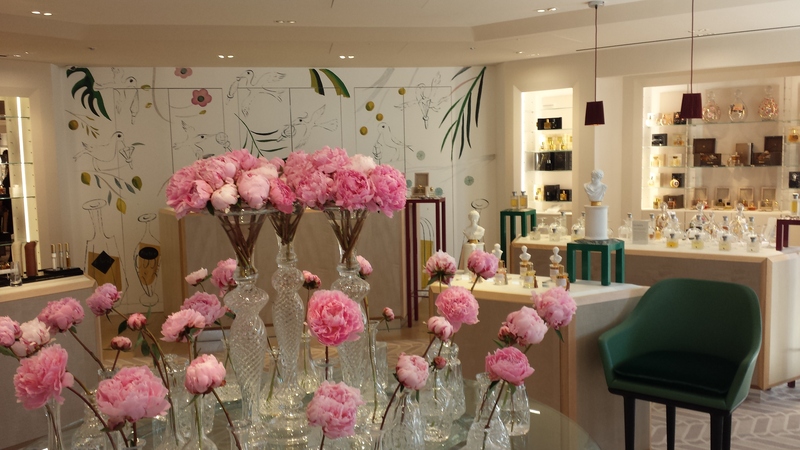 Round the corner from Penhaligon’s at Langley Court is the new branch of Bloom Perfumery. They are the only stockist in the UK of Vero Profumo and some of the many other brands are Arquiste, Parfumerie Generale, Etat Libre d’Orange, Frapin and Phaedon. The owner, Oxana, helpfully took us through a few new releases including Panorama by Olfactive Studio which is a shimmering bright green with a wasabi accord. We also had a preview of the next fragrance from Arquiste (caramelised/woody) which will come out in September. 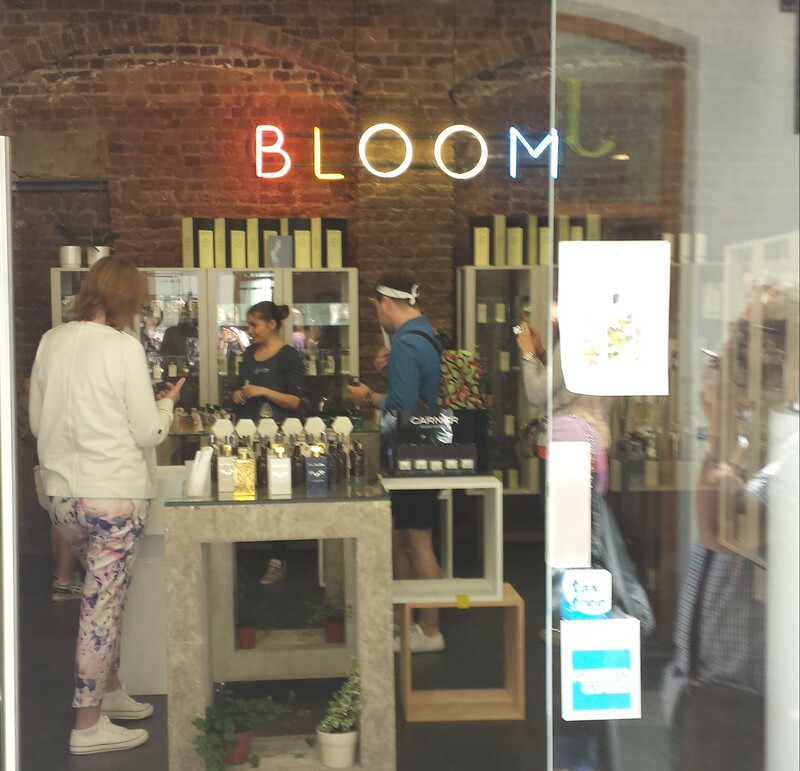 Oxana told me that Bloom are working with a perfumer to launch a bespoke fragrance service soon. After lunch at Bill’s (and much fun and laughter) we headed to Fortnum & Mason on Piccadilly, which has recently refurbished its perfumery department. They still have the Caron urns and brands like Grossmith and Creed, but they now have a small section for newer lines including 4160 Tuesdays and Heeley. After some top quality Fortnum’s ice-cream to-go, most of us headed back to Bloom. 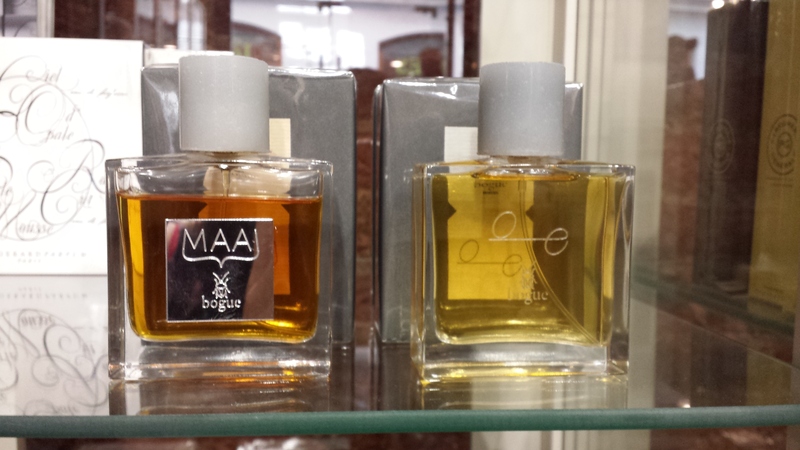 We were going to meet Antonio Gardoni of Bogue Profumo whose extraordinary fragrances are now being stocked there (read Michael’s fab review of MAAI here). I’d heard great things about Antonio and he turned out to be even more engaging and down to earth than I’d expected. Antonio said he thought it would be interesting to breakdown some of the different elements of MAAI for us. First he sprayed the original 40% version before distillation onto paper strips. Obviously this was powerful stuff but still smelt great. 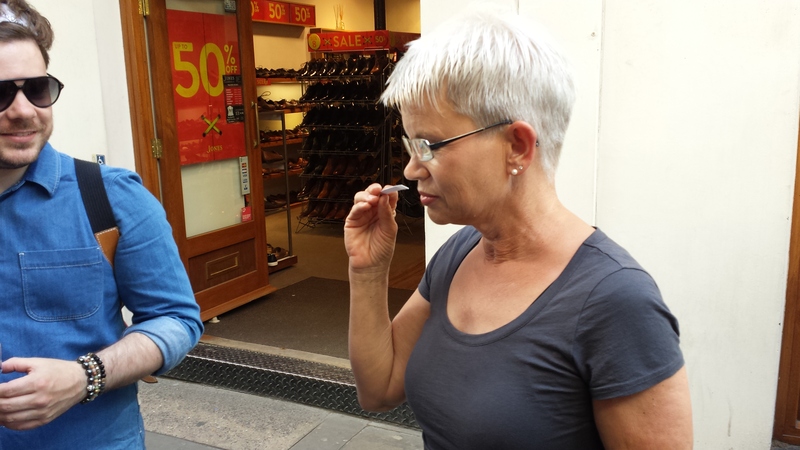 At first, he wanted to give the fragrance an incense base, but instead decided to go with a mixture of infused resins and sandalwood from China which we got to try in isolation. On more blotters, he shared the tuberose absolute he uses in MAAI at 30% dilution. This was strong enough to knock your socks off but still fantastic (I have recently learnt that it’s only heady, synthetic tuberose I have issues with). This was a very green tuberose with an earthy facet. I think I saw Thomas swoon a little. Next Antonio sprayed a solution of the four different aldehydes used in MAAI. I thought this might be pretty sneeze-inducing, but they were the more vintage-style, soap bubble type and actually rather gorgeous. Suzy remarked that she’d love to wear this as a perfume. I mentioned to Antonio that I felt MAAI was like several different fragrances in one. He told me that’s not what he set out to do but it turned out that way. He loves fragrances that evolve over time and MAAI changes a lot as it develops. It won best Niche/Artisanal Fragrance in the Basenotes Reader Awards 2015 and is well worth experiencing if you get the chance. 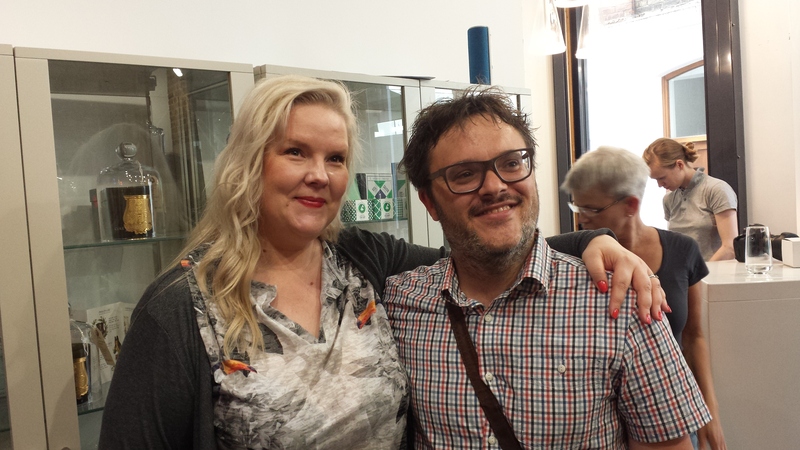 Antonio kindly gave me a decant of his other fragrance, O/E and I asked if he would tell us about it. 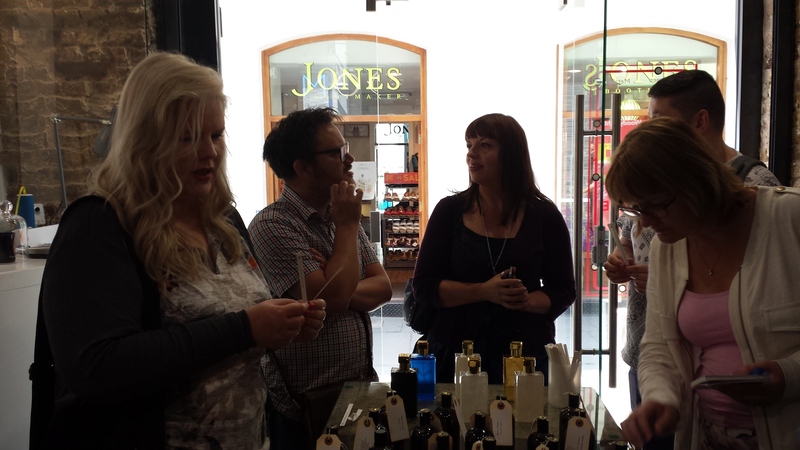 He explained that he loves citrus fragrances but they usually don’t last long. He told us O/E has every citrus fruit you can think of (lemon, lime, tangerine, grapefruit, mandarin, sweet and bitter orange…) as well as a number of different herbs. Antonio particularly likes the smell of rotting lemons and thought it would be interesting to create the effect of a lemon that was beginning to rot, being wrapped in a plastic bag. So he put in a little camphor which is a favourite aroma of his. He then added Iso E Super to give the naturals a synthetic contrast. To extend the longevity, he made clever use of balsams. These are present from the start, so that even when the citrus has faded, you think you can still smell it. It was wonderful to learn more about both MAAI and O/E first-hand from their creator. 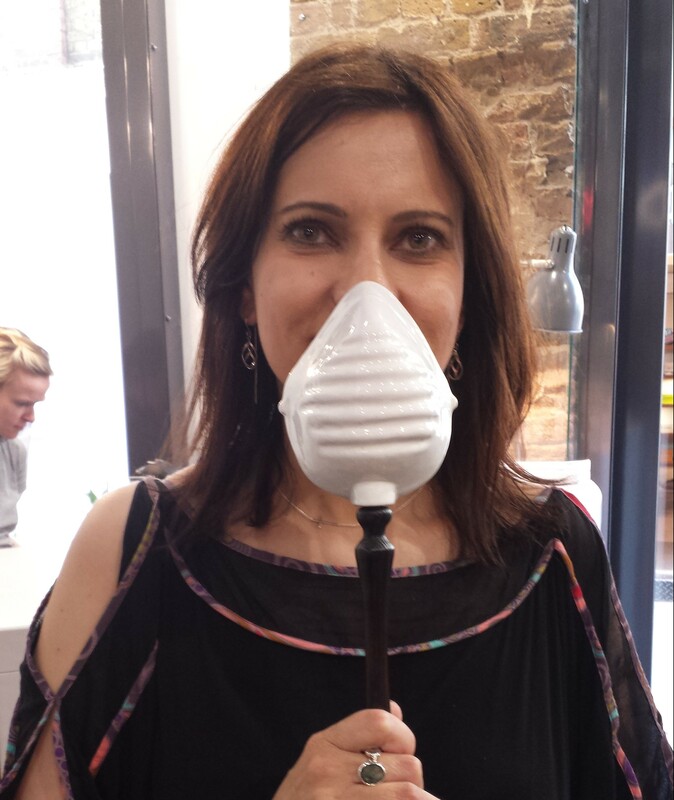 Of course, we all had to pose with the Bogue Mask; a striking terracotta aroma diffuser which is actually a really effective way of experiencing scent. A hopeful Thomas and a very skeptic Val. Thomas gifted her his bottle so who knows, it might grow on her. After a non-perfume shopping spree, Val, Hannah, Yasmin from Bloom and I had a quick coffee with Antonio before saying goodbye. We stumbled along what felt like a very long walk back to Euston Station at about 8 o’clock – thoroughly exhausted but completely happy. The whole group at Fortnum’s. Many thanks to Pia and Nick for their tremendous organisational skills and to everyone who came along for making it such an epic day. Special thanks to Antonio Gardoni for his fascinating Bogue masterclass. I’m already looking forward to next year’s gathering. 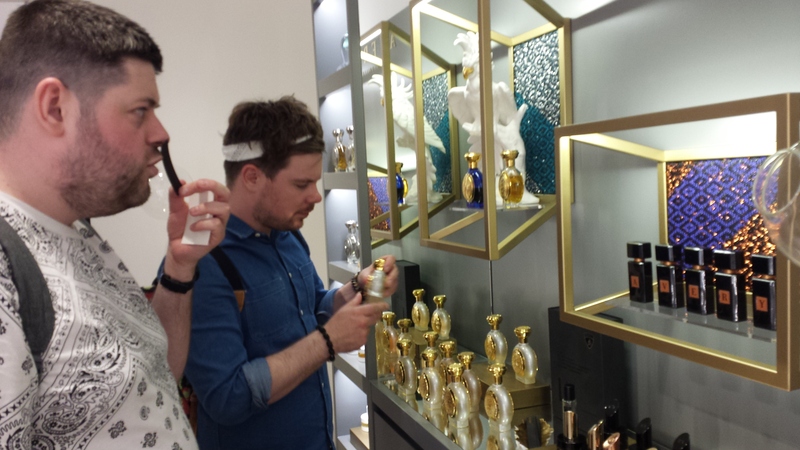 Have you been perfume shopping in London? Have you tried any fragrances from Bogue Profumo? This entry was posted in By Tara, Shopping, Travels and tagged Antonio Gardoni, bloggers, Bloom Perfumery, Bogue Perfume, Fragrance, London, Penhaligons, Perfume, shopping, Travel. Bookmark the permalink. Val, I forgot my notepad so I had to pay attention! I’m looking forward to your take on the day. Basenotes is great and was invaluable to me in the early days. Oh, this sounds like amazing fun! I should really try and come too. 🙂 I mean, I would very much want to. Ines, you know I’m going to hold you to that 🙂 It would be wonderful if you could make it next year. I feel as if I was there with you Tara. Sounds like you all had a wonderful time. That’s good to hear, Sandra. We will have our own mini meet-up next week. It’s always great meeting up with other perfume enthusiasts. I mean who else would nerd about the quality of tuberose? And that is of course a very important thing to do 🙂 Once again a great write up, which makes me nearly feel as if I was there. Thank you, Tara. I love the nerdiness of perfume people. Val and I were laughing afterwards because she took the testing of Angel so very seriously. The video clip I took is too funny. I’m keeping my fingers crossed that you can combine a trip to London with next year’s gathering. You must share the video!! Ha! Val was thinking of including it in her APJ post so we’ll see. Thanks, Thomas. Great to see you, as ever. Now I’m wondering what I missed at the pub! Hi Tara, funny you say that MAAI was like several different fragrances. That’s the exact impression I got when I was there at Bloom only last week. Federico who works there suggested to try it out. I thought it was a potpourri of Guerlains. Did you try ‘Berlin in winter’ by Baruti there? It is very unique and nice. It has got notes of woodsy bitter notes because of mastic oil and coffee and a soft veil of rose and iris shining through with leather and frankincense. That might be my next bottle, though I could not resist buying a sample already. How interesting that you also felt that way about MAAI. I love “a potpourri of Guerlains”. That’s quite a compliment I’d say. No I haven’t tried Berlin in Winter but you describe it beautifully. I hope you enjoy your bottle when you get it. I know, the year is just flying. Last year’s swap was great fun but I can’t even think about December yet! What an entertaining and comprehensive write up of a fantastic day, though I would expect nothing less from you. 🙂 The way Antonio deconstructed elements of MAAI sounds like a particular highlight. I was amused too by the rotting lemon reference. And hurrah re Tralala! Thanks, V! It was just a shame you weren’t there. I actually wrote more but cut it down as I thought it might rather be testing people’s patience. Yes, meeting Antonio and getting the breakdown of MAAI was a real high point. I hear her saying “I certainly didn’t hate it” – hah, awesome. Tara, we’ll interview her next week – you and me, together ! Right ? Oh, yes please! I’m all up for that. Can’t wait to see you next week, it’s been ages. Way too long. Just got a postcard from you guys. It came at exactly the right time. I feel loved and included. Thanks for writing up the day, I can hear all of your voices chatting and Val saying, “Wellll, I don’t HATE it.” in her fabulous gravel rashed voice. SO want to the Penhaligon’s & L’Artisan thing with Nick when I’m in town next year. I’m sure that I’m missing the point on some of their lovely offerings.